WELCOME TO ART&DENT. OUR TEAM OFFERS ADVANCED DENTISTRY IMPLANTOLOGY, ORTHODONTICS, DENTAL WHITENING AND MAXILLOFACIAL SURGERY. Why is Art&Dent a good option for you? Valencia airport offers excellent connections across Europe, with most destinations no more than 2 hours flight time away. Our city is one of the “best kept secrets” in Europe, and always worth a visit! At 200 square meters, our clinic is very spacious with several bright and airy treatment rooms, a comfortable reception area with WiFi, a consultation room, an X-ray room, and barrier-free bathroom facilities. Our treatment rooms are equipped with the very latest technology, and we work with a top class external laboratory. The Art&Dent team consists of highly qualified specialists in implantology, complete dental makeovers, oral hygiene, and general as well as cosmetic dentistry. Dr. Joaquin Rinon is our chief surgeon and implantologist. He has placed more than 10,000 implants during the course of his career. 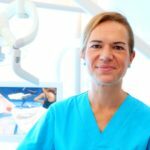 Dr. Rinon has gained international experience working in dental clinics in the UK, Switzerland, Germany, and South America before opening Art&Dent in Valencia. Dr Christiane Carvalho is our specialist for cosmetic dentistry. She has a special certification for the placement of and is the person to speak to if you wants to have a Hollywood smile. Our office manager will assist you with any questions, and will accompany you through the entire process, from your first appointment to your final treatment. We work as a team in order to deliver 100% satisfactory results for our patients.